To Send Mails by Electricity. 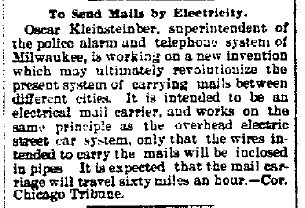 Oscar Kleinsteinber, superintendent of the police alarm and telephone system of Milwaukee, is working on a new invention which may ultimately revolutionize the present system of carrying mails between different cities. It is intended to be an electrical mail carrier, and works on the same principle as the overhead electric streetcar system, only that the wires intended to carry the mails will be inclosed in pipes. It is expected that the mail carriage will travel sixty miles an hour.–Cor. Chicago Tribune. Ah, if only we could use electricity to hurtle mail from one person to another, in entirely different cities, at the mind-boggling speed of sixty miles an hour! Oscar is, of course, referring specifically to physical copies of mail, which is still around today and hurtles down the freeways at well over 60 miles an hour. He’s also about fifty years too late if he had the inkling of a truly electricity-based method of mailing documents: the fax machine came about in the 1840s. Despite his unique name I couldn’t find any patents issued to Oscar, so while his invention made the news wires (which had already mastered electrical communication decades earlier), his electrically-powered mail transfer service never made it off the drawing board. You are currently browsing the The Infomercantile blog archives for November, 2012.